it fits in the case, easy to clean the straw. ☑The Autbye straw is reusable and collapsible, it is very small could carry with keychain. And very convenient for carry when we are travel, outing,at home or at office. ❶ ECO-FRIENDLY:This drinking straw is made of Food grade TPE tube,ABS suction nozzle and stainless steel body,it is very safe for you to use. ❷ CONVENIENT: It is a collapsible reusable straw with Aluminium Alloy keychain case,very flexible and convenient to be used and carried anywhere in travel. ❸RIGHT SIZE & CLEAN:Length is 23cm（9in）and Diameter is 0.6cm(0.24in),besides,it comes with cleaning brush in case,so very easy for you to clean the straw. 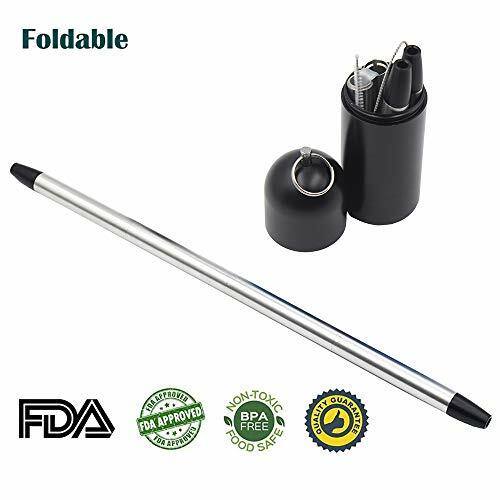 ❹ CE & FDA:Our straw passed CE and FDA Safety certificates,people can use with no worry. ❺ HIGH QUALITY GUARANTEE: Our product is 100% no-worried money back guarantee in quality, any quality problems, please feel free to contact us, we will do our best to satisfy you and refund you within 24hours. If you have any questions about this product by Autbye, contact us by completing and submitting the form below. If you are looking for a specif part number, please include it with your message.